Thanks to filmmaker Sujoy Ghosh, we had put out the script of Kahaani here. And here’s an interesting post by one of our readers Deepanjali B Sarkar where she compares the script with the film. And also keeps a check on the timeline – what happens where, at what time, and for how long. Over to her. I’ve now seen Kahaani several times, the last time with the script in hand, provided by this blog. Here are some rapid notes I made – mainly on the pacing and plot points (which is what makes it such a gripping film). Sharing it – in case others find it useful. Have listed the run time at which each plot point takes place. Hook – introduced within 10 mins: taxi driver says it’s for the first time that he has driven someone to the police station straight from the airport. Add to that – that she is pregnant. Husband worked in National Data Centre. Later we get to know the main suspect Milan Damji is an employee of National Data Centre, as is Shridhar, the IT head who assigns Bob Biswas, the hired assassin, his targets. Vidya is a firewall expert. Crucial in her gaining access to IT head’s system, which leads them to IB head, Bhaskaran. Vidya has a dizzy spell when asked to sign the missing person report. Pay off – she never left behind any fingerprints. First red herring: Mona Lisa Hotel. Approx 20 mins. By the way – had a question here. Did her husband actually stay here? Or how did she know of the decorative piece, the peacock? If he didn’t why this hotel in particular? Because it didn’t keep any records of its guests? But why will Bhaskaran approach Bajpayee when he himself is the kingpin of the entire operation? Vidya voices audience’s doubts. Missing from script. (1) Arnab has deserted her (2) Arnab and Milan are one and the same (3) Arnab has been targeted because he looks like Milan Damji. Transition scene: Missing in script. Lovely touch of the playful side of Vidya. The two are travelling in a tram, she accidentally kicks Rana. He touches his forehead (pranam). She is intrigued and playfully kicks him again…and again! Clue – follow up- Bombay blood required by Milan Damji when he was admitted in Ekbalpur Nursing Home. Scene 149: Nice touch. Bob is shining his nails when he gets his next job. He looks exasperated and the way he says to rickshaw valla – turn around, it looks as if he’s been given an errand to run to the fish market before leaving for office! Scene 167 – 168: Shridhar chases Vidya. Fight between Rana and Shridhar. Vidya kills Shridhar. Scene 169: Khan arrives on scene. Says he wanted Shridhar alive to lead them onto Damji. Scene 171: Not present in script. Panchami-idols come at night. Vidya watches a Durga idol. Charulata shot: from window to next window she follows the idol atop a truck. Ekla chalo re song plays in the background. She is readying herself for the final slaying of the demon – Milan Damji. Scene ends with close up of Durga’s lion on beheaded head of Asura Mahishasura and Goddess being bedecked with jewellery. She is being empowered. FINAL CLUE! Vidya finds a code in Sridhar’s computer she can’t decipher. Rana realises it might be a phone number. Turns out to be Bhaskaran’s old number. Khan asks Vidya to call Bhaskaran – rest in script. “Upping the ante” as they say! Rana begs Khan to call off operation as Vidya’s life is in danger. Khan locks him up. Mocks him – don’t love the wrong person. 1.39 hrs. – Vidya meets Rana at his home. This scene is replaced by a scene in front of Kalighat Police station. Vidya sees women in red border sarees going to Kalighat temple and remembers her conversation with Arnab. – The change of location works – more colour. Also, home would have been too intimate. Would have struck a wrong note – why should Vidya visit him at his home? The plot moves because Vidya is pregnant – leading to disclosures. OC says husband got her pregnant and is absconding. IB – Khan reiterates the same. Emphasis on her as a victim of a domestic case. No one takes her missing file report seriously. Rana is of course chivalrous and concerned. Fun side of Vidya, making her endearing. Our empathy increases: Teases Bishnu about his radio; Gentle with Poltu; Mocks Rana. About his name. Mocks him when she makes him pick locks, twice (Data Centre Office; Damji’s house); Kicks him in tram. Rana’s growing attraction towards Vidya. Very economically dealt with. No dialogues: Concerned. Caring. Always worried she might hurt herself as she bends down, climbs stairs. Holds her hand. Intrigued, charmed by her playful side when she deliberately kicks him in the tram. Admires her tenacity. Admires her knack with children. Glowingly praises her maternal instinct. When Vidya bends over him as she checks computer records – he is acutely conscious of his attraction towards her. When Vidya gets to know from Khan that she is being used as a bait she is appalled. Asks – her life, her child’s life was at threat. Immediately Rana says nothing would have happened to her – because he had taken up the case solely to ensure she was safe. Khan gives an amused, meaningful glance at Rana. He knows Rana has fallen for Vidya. Gifts her a sari, on behalf of Arnab. Genuinely cares for her. RD Burman influence: Songs being played on radio in several street sequences; Song played on car radio when Sridhar realises his computer is being backed is Lekar hum deewana dil. Disney-UTV has announced its slate for 2013. While most of us knew about their releases, what’s most interesting for me is the official synopsis of all the films. For example we have been hearing about Chennai Express’ pitch in hush-hush tone for a long time. This one just makes it official. Do check it out. Wish they had given out writers name with all the films too. And i hope other studios could also do something on similar lines. Synopsis : The story of Race 2 is set in the lush locales of exotic Europe, with a backdrop of gambling and Casinos. A fast paced thriller that takes the legacy of “Race1”forward, with high octane action, combined with thrills and twists that have a roller coaster effect, and edge of the seat excitement. Synopsis : For Vishnu (Prabhudheva), widely regarded as India’s best dancer, dance is more than a passion – it’s the reason he lives! So when he finds himself thrown out from the swish dance academy he himself set up, by his manipulative business partner, it feels like the oxygen has been sucked out from the air he breathes. Heart-broken, Vishnu decides to give up dance and leave Mumbai forever. However the night before his departure he witnesses a most amazing sight – a group of dancers preparing for the upcoming Ganpati Dance Battle – an annual festival that pits Mumbai’s best dance groups against each other. Watching the raw talent of these amazing dancers helps Vishnu arrive at a decision – he will take this disparate group under his wing, help them overcome their personal rivalries and past demons and turn them into India’s best dance squad!. From India’s biggest film studio, UTV Motion Pictures, and renowned choreographer & director, Remo D’souza comes India’s first dance film in 3D– a spectacular entertainer that proves yet again that if you dare to dream, impossible is nothing! Synopsis : Best friends Ishaan, Omi and Govind – young, ambitious and restless – are trying to make a mark in the India of the early 2000’s. These are exciting times – a new millennium has just dawned, India is a nuclear power and ostensibly shining – a perfect place for the 3 Ahmedabad boys to start a business that could be their ticket to fame and riches. In a country where cricket is religion, they hit upon a brilliant plan – to start a training academy that could produce India’s next sporting superstars! What follows is without doubt the greatest adventure of their lives, as they attempt to navigate the big hurdles in the path of fulfilling their dreams. Based on Chetan Bhagat’s bestselling novel “The Three Mistakes of My Life”, Kai Po Che (meaning a triumphant yell in Gujarati) is an unforgettable ode to friendship and the magical moments one shares with one’s closest pals – celebrating festivals, drunken dancing, watching cricket matches together, strategizing on how to catch the attention of the cute neighborhood girl, being there to watch each other’s back in troubled times and to celebrate one’s successes by screaming “Kai Po Che”! Synopsis : The biggest remake of the 80s Bollywood cult classic “Himmatwala” is a story of a poor and wronged mothers son who comes to the village to avenge his father. Synopsis : When Sanju (Emraan Hashmi), a suave, master safe cracker wants to retire from a career in crime, he decides to team up with two dangerous criminals to commit one last heist. A bank robbery that will ensure that he never has to worry about money again! Everything goes according to plan. Sanju is given the task of hiding the money till things cool down and the booty can be split. Two months later the associates return to collect their share of the loot, but Sanju refuses to even recognize them! What dangerous game is Sanju playing? Ghanchakkar is a crazy, quirky rollercoaster suspense ride that will surprise, shock and entertain the audience at every turn. Synopsis : The film deals with the movement of the middle-class to re-negotiate democracy. It’s the story of a man who is a firm believer of Gandhian principles, an ambitious entrepreneur who represents the modern India shining philosophy, a social activist who aims to be a politician, a fearless political journalist and a wily politician who uses every means to break the system. Synopsis : The story is about a man’s journey from Mumbai to Rameshwaram and what happens during the journey. Synopsis : Settai is a remake of the 2011 Bollywood comedy, Delhi Belly. Synopsis : It is about father & son’s relationship. A son’s desire to fulfill the desire of his father. If you have been a regular follower of this blog, you surely know about Subrat. If not, you can read some of his old posts here, here, here and here. So as we all discussed Kahaani, we realised there’s more to it. And who better than our favourite Prof. Saab to do the dissection. Was it just “if you can’t convince them, confuse them”? Or was there more? Read on, scratch your head and do put your comments. And read only if you have seen the film. Otherwise it wouldn’t make sense. SPOILER ALERT – DON’T GO AHEAD if you haven’t seen it yet. Go and watch the film and do come back. It will be fun! It is a rare film that receives both critical acclaim and box office success. Kahaani seems to have managed that. The central cast and the editing have earned well deserved praise. Kolkata has been lovingly shot and, as many reviews have noted, is almost a character in the film. A lot of people have called it a taut thriller. This is where our paths diverge. For me, Kahaani is as much a taut thriller as Golmaal – 2 is a cerebral comedy. I admit it was nicely paced but a taut thriller has to satisfy a more fundamental criteria – the plot should make sense. It didn’t make the cut for me. I have watched it only once and I am ready to admit I might be wrong on this. I guess the best course of action is to put my reservations on the plot here and seek your responses. I have left out a couple of issues that have been discussed on other blogs which bothered me as well; namely, Vidya’s recollections of her husband had Milan Damji and the fact that Vidya was introduced as Vidya Venkatesan Bagchi at the start of the film. I can live with these as I did with such chicanery in that other ‘taut thriller’ A Wednesday. 1. Please help me explain the motive of Bhaskaran (Dhritimaan), the IB Chief. He was complicit with Milan Damji or may have even been the kingpin. Why did he then send Khan (Nawaz) immediately to Kolkata the moment he heard someone enquiring about Milan Damji? Nawaz is portrayed as a competent officer and wasn’t complicit. So, why was he digging his own grave by sending him over there? Instead, he should have been trying to provide as little help to anyone trying to enquire about Milan Damji. 2. Why did Bhaskaran approach Darshan Zariwala (the retired IB officer who had trained Milan) and ask him to come back to IB to nab Milan? Not satisfied with #1, he wants another of his good officers back to get hold of Milan Damji. Don’t tell me he was keeping up the appearances so that no one suspects him. This man seems to be suicidal. 3. What kind of investigation had Nawaz done the first time around? He hadn’t even spoken to Agnes (the HR lady of National Data Centre). Had he done so, he would have found the dusty file of Milan in that old, abandoned office and his address long ago. Didn’t Darshan Zariwala know anything about Milan while training him to help Nawaz in his investigations? I mean before Milan turned against the system, the IB should have had a good idea of where in Kolkata was he staying etc. Also, why was Milan Damji working in National Data Centre under his real name? 5. Didn’t Nawaz keep his boss in the loop during his stay in Kolkata? Then, Bhaskaran would have known that Nawaz is now using a pregnant woman to get to Milan Damji and eventually to him. 6. Why was that HR lady who replaced Agnes so happy to help Vidya and Rana in sneaking into Shridhar’s cabin? She knew the previous incumbent (Agnes) was shot dead after trying to help Vidya. Another suicidal character? And, what kind of a IB haunt is the NDC where there is a lone guard at the entrance while there’s a rear exit unguarded? 7. Why did Vidya kill Shridhar? It was made to appear she did it deliberately so that he wouldn’t be interrogated by the IB directly. But, Vidya and Rana were originally planning to hack into the computer, steal the data and scoot. In which case Shridhar would have lived and Rana (who was working for Nawaz) who would have asked Nawaz to pick him up for interrogation. It was Shridhar who had made sure he would get a message in case someone hacked into his system. This led him back to his office and then to chase Vidya and Rana. It was a convenient thing to show that Vidya planned on killing him when she had no control on Shridhar chasing them after they had hacked into the system. 8. How was Bhaskaran convinced that Vidya had gotten some files from Shridhar’s computer that would lead her to Milan and eventually to him? Why would then Milan come for collecting those files? I can go on with a few more. May be you have the answers. May be we should all make leaps of imagination to bring credibility to the plot. May be I should watch Kahaani again. May be, one day, we will make a genuine taut thriller. It’s raining trailers and how! The theatrical trailer of Sujoy Ghosh’s Kahaani is finally out. Have a look. Balan seems to be on Bull run and in this one she doesn’t even have a hero opposite her. 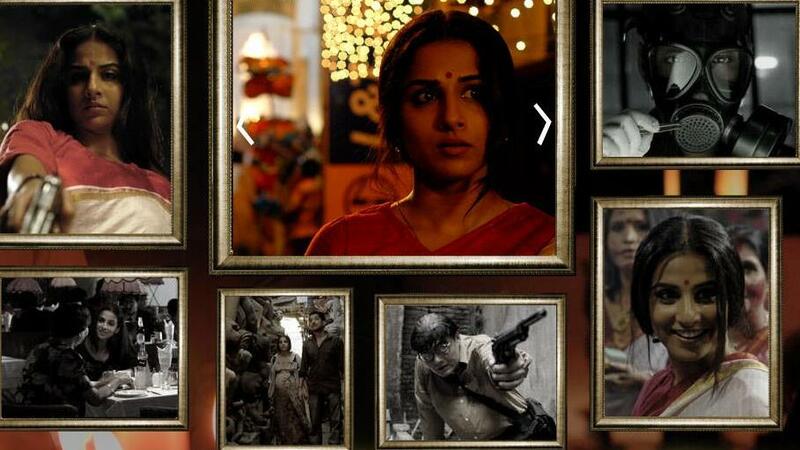 The film stars Vidya Balan, Parambrata Chattopadhyay and Nawazuddin Siddiqui. And the writing credits include Sujoy Ghosh (story/screenplay/dialogues), Advaita Kala (story), Suresh Nair/Nikhil Vyas (Additional screenplay), Ritesh Shah (Dialogues) and Sutapa Sikdar (Dialogues) . The film has music by Vishal-Shekhar. Vidya Bagchi arrives in Kolkata from London to find her missing husband. Seven month pregnant and alone in a festive city, she begins a relentless search for her husband. With nothing to rely on except fragment from her memories about him, all clues seem to reach a dead end when everyone tries to convince Vidya that her husband does not exist. She slowly realizes that nothing is what it seems. In a city soaked in lies, Vidya is determined to unravel the truth about her husband – for herself and her unborn child even at the cost her own life. Does The Dirty Picture pass the Bechdel Test? The Dirty Picture is one of the most talked about films of the year. Though it got mixed response from critics, the box office numbers are producers’ delight. Interestingly, there are two women who are credited for the film. Vidya Balan and Ekta Kapoor – one who shed all inhibitions for the role and the other who decided to back the film. As some of us were discussing the film, we wondered if The Dirty Picture pass the well-known Bechdel Test. It’s a litmus test for female presence in movies, tv and other pop culture stuff. In order to pass the Bechdel Test, you have to find out the answer to these three questions. 1. Are there two or more women characters with names? 2. Do the women characters talk to each other? 3. And do the women talk to each other about something other than a man? Click on the play button to check out the video and you will be surprised to know that most Hollywood films don’t pass the test. To quote from the official page, The Bechdel Test is a simple way to gauge the active presence of female characters in Hollywood films and just how well rounded and complete those roles are. It was created by Allison Bechdel in her comic strip Dykes to Watch Out For in 1985. It is astonishing the number of popular movies that can’t pass this simple test. It demonstrates how little women’s complex and interesting lives are underrepresented or non existent in the film industry. We are bit confused if The Dirty Picture passes the test or not. Silk and Ammaji talk but Ammaji doesn’t have a name, right? Do leave your comments in the comment box. But most importantly, how many bollywood films of 2011 can pass the Bechdel test? Let’s try. After OUATIM, producer Ekta Kapoor, director Milan Luthria and writer Rajat Arorra have again come together for their next film The Dirty Pciture. The film stars Naseeruddin Shah, Vidya Balan, Emraan Hashmi and Tusshar. DoP is Bobby Singh and it has music by Vishal-Shekhar. Looks like Vidya Balan is going full throttle with this one and without any kind of inhibitions. Plus Bappi Lahiri’s vocals and zimbly zouth kitsch all over, the trailer is exactly what one would expect from this film. It’s one film which must have been “hit” even at the idea level, all they needed was a good actress. Bring it on! Also one good thing they have done is that they didn’t compromise on the trailer and kept Tusshar only for few seconds. Sadly we have to tolerate him in the film.